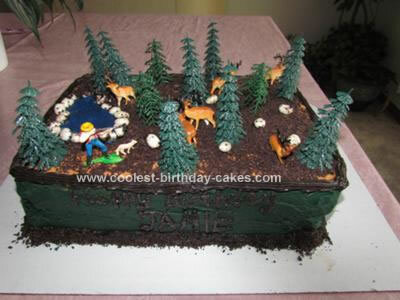 I was inspired to make this Homemade Deer Hunting Cake for my husband since he is a big hunter. I started off by making two cakes each in 13×9 inch pans. I then put buttercream frosting in between the cakes to keep them held together and stacked one on top of the other. The entire cake was frosted with buttercream frosting. I used a light brown dye for the top of the cake, a forest green for the sides of the cake. I used a dark brown and a tip of decorators choice for the top and bottom lining of the cake. I used some deep blue and made a small pond on the top of the cake. I crushed up Oreos in a food processor and sprinkled it on the top of the cake to look like dirt. I then used some extra crushed Oreos and put a teaspoon of water in the mix to make it a little bit wet and rolled some yogurt covered raisins in to make them look “muddy”. 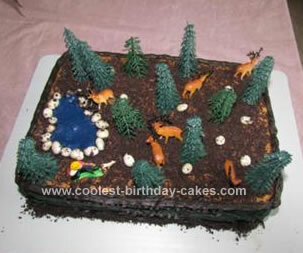 I spread a few on the top of the cake for rocks as well as outlined the pond with the raisins. 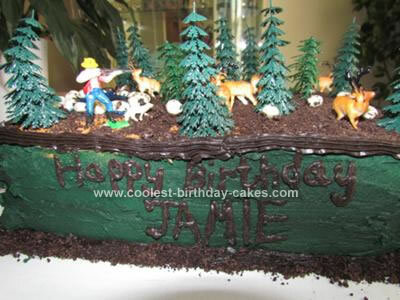 I had some forest trees and bucks as well as a hunter figurine that I put on the top of the cake. I took some more crushed Oreos and sprinkled on the bottom rim of the cake. Voila! Finished!